Virginia Governor Terry McAuliffe said that police were told to stand down due to being outgunned by white supremacists in Charlottesville. Virginia Governor Terry McAuliffe told the New York Times that police were told to stand down at the 'Unite the Right' rally that turned deadly, due to the heavily represented white supremacists having better guns then the cops did. "They had better equipment than the police did," he said. "You saw the 'militia' walking down the street, you would have thought they were an army." "Over 80% of them had automatic weapons." Police had come under criticism for their slow response to the violence unfolding in Charlottesville, Virginia. 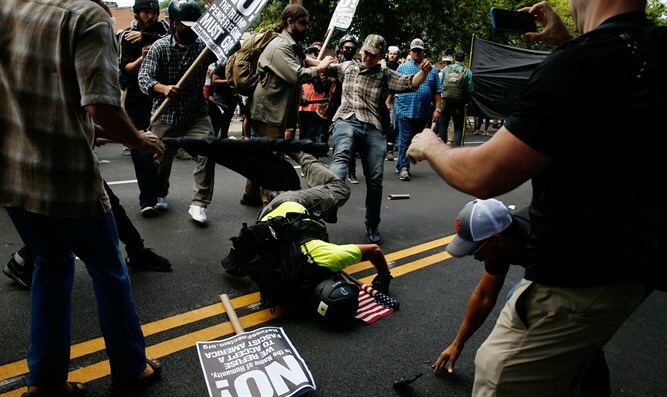 White supremacists, many of them heavily armed and bearing Nazi flags, had descended on the town for a rally titled 'Unite the Right,' and were met by a radical 'Antifa' leftists. Videos appeared to show the police standing off to the side as the violence raged between the two sides, only stepping in after 20-year-old James Fields, of Ohio barreled his silver Dodge Charger into a group protesting the rally and killing 32 year old Heather Heyer. Two Virginia State Policemen also died when the helicopter they were in crashed while they were monitoring the rally. Virginia State Governor Terry McAuliffe declared a state of emergency, and had a sharp message for the alt-right participants. " You are not wanted in this great commonwealth. Shame on you. Go Home" he said at a press conference. US President Donald Trump raised hackles when he said that "we condemn in the strongest possible terms this egregious display of hatred, bigotry and violence, on many sides. On many sides." Many blasted the president for making an equivalence between the supremacists and the counter-demonstrators. "It is time to condemn racist-white supremacist neo-Nazi hatred and violence by name!" tweeted former Anti Defamation League (ADL) head Abraham Foxman.